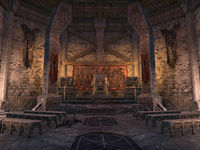 Sanctuary of Malacath is a hidden sanctuary below Fharun Keep in Fharun Stronghold. To reach it, you need to first clear your way past Vosh Rakh cultists and enter Fharun Keep located in the middle of the stronghold. 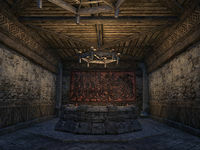 In the western wing of the keep there is a shrine dedicated to Malacath. 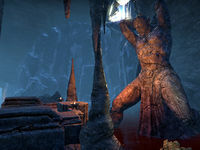 Pressing the big stone head of Malacath teleports you to Prayer Rooms where you need to solve a puzzle involving three doors before being able to proceed further. You need to use a door that is marked with a lit candle—a symbol for the followers of Malacath—in order to gain access to the Hall of Faith. In the Hall of Faith is a deep well - leap deep into that well, and you have finally arrived to the hidden sanctuary. The exit from the sanctuary leads to outside of the stronghold; the exit is not usable from outside. There are several Foul Water fishing holes near the big statue of Malacath. The way into the sanctuary is outlined in the book Path of the Faithful. Blood and the Sacred Words: Protect the sacred words of Malacath from the Vosh Rakh. This page was last modified on 19 November 2018, at 06:56.